Add the mushrooms and cook, stirring frequently, until the mushrooms are browned and have given up their liquid. Remove the mushrooms from the butter with a slotted spoon and set aside. Add the flour to the butter remaining in the saucepan and stir. Continue cooking over medium heat until the flour turns light brown. This will take about 10 minutes, but watch the mixture carefully so the flour doesn't burn. When the flour is browned, add the beef stock and wine, if using, and stir with a wire whisk. Bring the mixture to a simmer. When the sauce has thickened slightly, add the reserved mushrooms, salt, and paprika, if using, and stir gently with a wooden spoon. Season with additional salt and paprika before serving. Using any type of mushrooms you prefer. Button mushrooms are a basic and tasty choice, but you can add flavor and elegance with varieties like cremini or shitake. For a truly unique gravy mixture, combine more than one variety of mushrooms in the same batch rather than sticking with just one kind. Add onion to this sauce for more flavor. Add 1 medium minced onion to the butter before you add the mushrooms, and simmer for 5 minutes. If you don't want to use red wine, you can just leave it out or instead substitute an equal quantity of balsamic vinegar or vegetable stock. To keep this sauce warm for serving, put it into the top of a double boiler and place over hot, not simmering, water. Cover the sauce to keep warm up to 30 minutes. 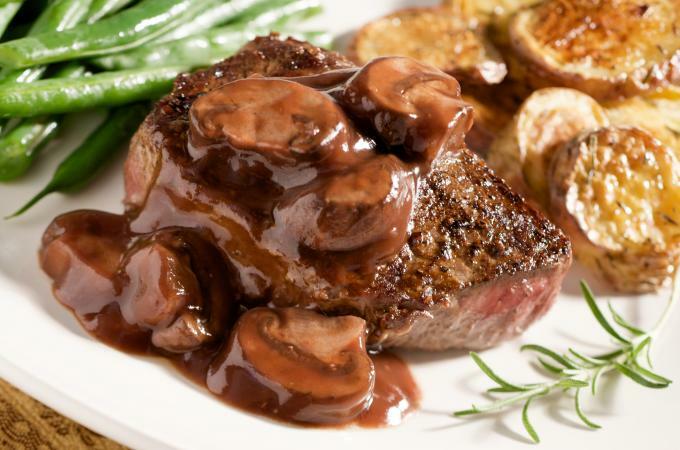 Serve this sauce over grilled steak, roast, or beef tips for an elegant beef main course. Use it to create hamburger steak or spoon over meatloaf or meatballs for a hearty, comforting entrée. Serve it over starchy side dishes like rice, mashed or sliced roasted potatoes, or your favorite stuffing recipe. Vegetable side dishes like green beans or brussel sprouts are a nice accompaniment. Store leftover gravy in the refrigerator for up to one week, in an airtight storage container. For the first two days after making this recipe, you can simply reheat it in the microwave or on the stovetop to serve leftover gravy. After that, you may need to bring it to a boil before serving it again. You can also freeze this gravy in right-sized portions to thaw and serve later. According to the Kitchn.com, homemade gravy made with a flour-based recipe (like this one!) can be frozen for as long as four months.